I would hope that as we scientists go more to the Internet for display of our work, that science fairs will become a commonplace theme on the Internet. It would be a great way for the world to see the great creativity in our students. 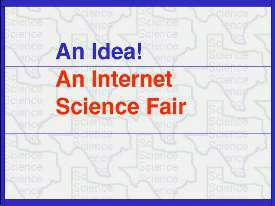 I hope that teachers from the STAT will design and build this Science Fair Internet. Take a look at this ScienceFair for some ideas.